New Quilt and maybe a Pattern! This weekend, for the first time in ages, I didn't have much on, which meant I finally had time to finish the quilt I started last month. I'd forgotten how fun they are to design and make, and how the little details, like making your own binding, can be so rewarding. For this quilt I had a few aims - I wanted to make it small and lap-sized (perfect for the cooling weather here in Melbourne), to test out a simple pattern I had in mind, and also show the size of a quilt made using five panels of my fabric (which are around the size of a fat quarter). I'd already cut and started sewing up the pieces for the front, and finishing this off didn't take too much time. Then I dug deep into my stash to find some fabric for the binding and the backing - pieces that fit in with the overall colour palette but also provide a bit of contrast. For the binding I chose some fabric I printed in my old studio in Kensington in around 2009 (which is horrifyingly nearly 10 years ago!) It's a small brown dot on a beige cotton linen and mixed in well with the other basecloth fabrics. For the backing I chose some of my yardage fabric from around the same time - Akzidenz alphabet printed on a sturdy organic cotton, in a mushroom grey ink. I recently found a small bolt of this hidden under a bunch of other fabric, which was a nice surprise discovery! For the actual quilting part I simply sewed across the front in long lines - kind of boring but I'm not into facing quilting stitch patterns. This part is quite meditative, and makes me appreciate how good it is having the right tools, like a proper walking foot (a bit of an investment but totally worth it!). 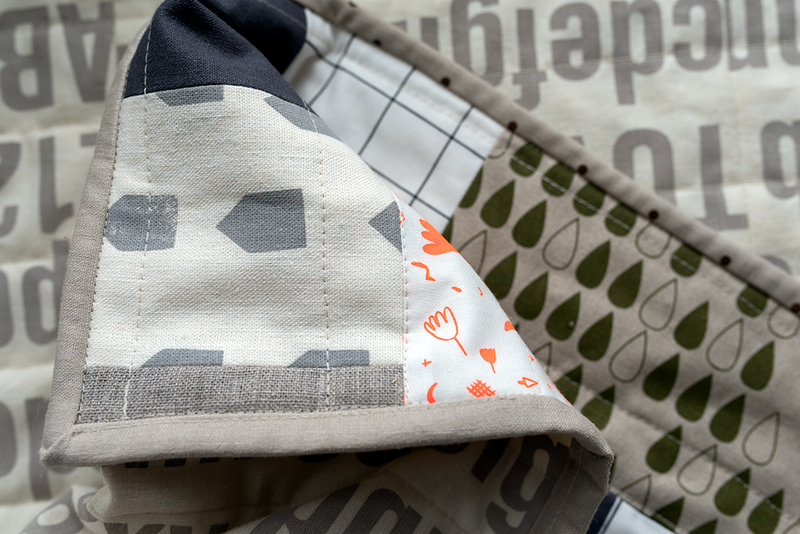 The pattern for the quilt is super simple - squares and rectangles made by cutting up five different panels of Spin Spin fabric (including one plain unprinted panel, the charcoal coloured pieces), then arranging them into a grid. I used a super generous 1cm seam allowance, which I'd probably reduce a bit next time - this would also mean the quilt would be a bit bigger, as there are so many pieces! For the homemade binding I made strips of fabric 2.5" wide but next time I think I'll make the strips a bit wider, so you can see more of it. It would also make sewing it on a bit easier, as there's more room to move. The overall size of this finished quilt is just what I wanted - around 90cm x 100cm (35" x 39.5"). I'd love to know what you think of the look of this quilt and also if you'd be interested in a pattern - please comment if you do/don't like it or if you've got any suggestions. If you'd prefer to send me a message that'd be great too. Below are some images to give you more of a look and if you keep an eye on my shop, in the next day or so you'll find the April fabric special, a pack of five pieces :) And did I mention that next time I want to make an 8- or 10-panel quilt? I might need a bit more time to sew that one up, hmm. The other day I was doing something and then I had to stop, drop what I was doing and just start making a quilt, as you do. And a quilt with a pattern, no less. A quilt pattern is something I've been working on for a while but it just wasn't, well, working. But suddenly it all made sense - I'd be trying to map it all out on the computer and the process was confusing and annoying. Then I realised all I need to do is just measure actual fabric, cut, arrange and sew. So I just did that. I started by cutting up four of the fat quarter panels from the March Special Fabric, and arranged them in a way that kind of 'worked', to my eye anyway (see above). On a whim I added one plain fabric panel, of a lovely charcoal hemp/organic cotton. This is a thing I always seem to do when sewing quilts made from my own fabric - break up the crazy pattern/colour by adding some plain textured/coloured fabric to even things out. Suddenly the quilt-in-the-making was looking kinda how I wanted, plus it was a bit bigger, which was a bonus (laid out and unsewn, it was around 100cm wide x 120 high - around 39" x 47"). The sewing together bit is pretty straightforward - I just take each row and sew the bits together, then sew the rows together. That's what I'm in the middle of doing now, so watch this space to see the finished product! Next week... In the meantime, happy weekend.